A political strategist named Ma. Lourdes Tiquia of Manila Times wrote an article about her takes on President Rodrigo Duterte's accomplishments on the world stage. "Who would have thought that a mayor could pull out a homer in dealing with Asian behemoths like China and Japan? 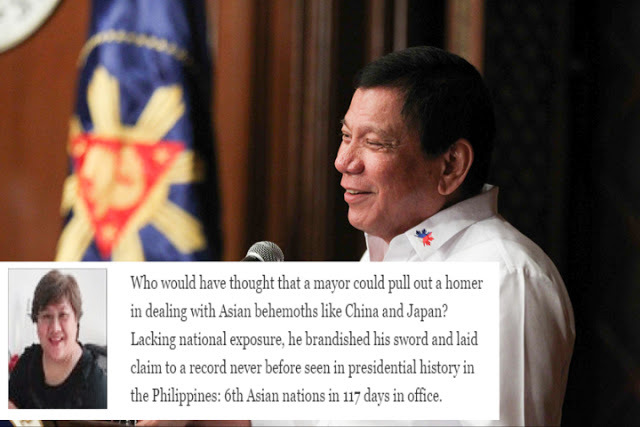 Lacking national exposure, he brandished his sword and laid claim to a record never before seen in presidential history in the Philippines: 6th Asian nations in 117 days in office. Derisively called mad man by his critics, there is serious thinking in his “madness.” Visiting Laos, Indonesia, Vietnam, Brunei, China and Japan, PRRD has set the stage for a peaceful region, lights on for Asia and ASEAN and a face-to-face diplomacy that has never been seen from a David like the Philippines. There is rhyme and reason where he went and the key messages he called out in those visits. The Duterte Initiative has made the Philippines top of mind. Apart from Manny Pacquiao, foreigners meeting Filipinos have been asking about Duterte. Seriously, the “mad man” is a rockstar. The call outs have been consistent: economic, illegal drugs, security in bilateral talks. Laos was Bud Dajo and getting the attention of the US (and Duterte got it big time). Indonesia (biggest Muslim country in ASEAN) was about illegal drugs trade, Mary Jane Veloso, AEC and comparing leadership notes (Widodo was Jakarta mayor before becoming president). Vietnam was “economic bilateral cooperation, including stronger partnership in economic, agriculture, defense and maritime cooperation, and war against illegal drugs.” Brunei was “trade and investments and developing our halal sector and micro, small and medium enterprises, support for the government’s anti-narcotics campaign” and the re-engineering of BIMP-EAGA. China is trade and security as well as exploring peace within the framework of the decision of the International Court. Japan is rebalancing in the region, among others. There are four essential elements of a state: population, territory, government and sovereignty. The first two constitute the physical and material basis of a state and the last two, its political and spiritual basis. Of late, international recognition has been added. This is the recognition of the sovereign status of a new state by other states. Recognition has political dimensions in the community of nations. Recognition becomes the magnet that can attract investors and foreign direct investments. Recognition is also a reward for pursuing domestic policies that reform age old issues such as crime, corruption and inefficiencies in the system. It is interesting to note that what appeared to be a faux pas on schedules of presidential foreign trips turned out to be a defining moment for the country as she grapples reframing foreign policy and rebalancing powers and influences in the region. PRRD was after all supposed to go first to Japan then to China. Critics were up in arms in the sudden change saying “a president does not mess up foreign schedules, just like that.” The sudden change can now be understood in the light of the declaration by PRRD, “Japan is and will always be a true friend.” A rare display from the bad mouth leader. Clearly, the Philippines is not pivoting to anyone. It is rebalancing the region in what appears to be Japan being the fulcrum. With Duterte’s deft move, Japan is now the countervailing force to China in the region. It has been 44 years since 29 September 1972 that China and Japan normalized diplomatic relations, two countries that spent much of the 20th century in mutual enmity if not at outright war. The anniversary comes at a low point in Sino-Japanese relations amid a dispute over an island chain in the East China Sea known as the Senkaku Islands in Japan and Diaoyu Islands in China. This was the other backdrop in play during the visit of PRRD to Japan. The Philippines, with its arbitral award, teaches Japan how to flex its muscles without wringing necks and that is the audacity of Digong, the trump card was never played and we got win-win in China and Japan. Sponsor From the China visit where we had the red carpet rolled out and a welcome ceremony unparalleled to none, “China has committed a total of USD 24billion to the Philippines. USD 15billion are in economic deals and USD 9billion in soft loans. To Japan who has committed to the Philippines USD 2billionin economic deals and USD 48million in soft loans. Duterte finally made it known to all that an independent foreign policy should be “consistent with the Constitution, protective of national interests and beneficial to the people.” Clearly, Duterte has chosen to articulate in the visit to Japan what to his view is good for the country. PH-Japan relationship is “best viewed as exemplary partnership that can only gain strength in the years to come.” Notice the contrast with the US. The Duterte Initiative will close out in the remaining days of the year with visits to Malaysia and Russia. And after these visits, one can put together clearly the Duterte Initiative. Clearly, that is purely Asia in orientation. In fine, I shall return has never been truly laden with good intentions."